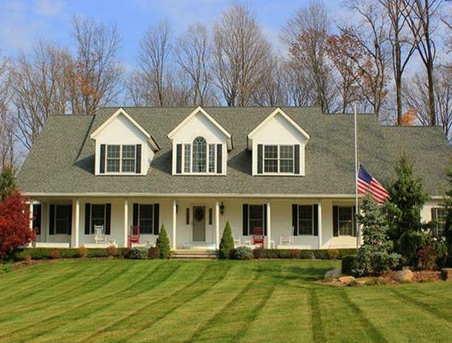 This spectacular white colonial style home was built in 2005. It sits on 1.18 acres and has a very well kept and manicured yard. The front of the house is fully landscaped with colorful bushes and plants that accent the style of the home. The red brick walkway that leads to the front door of this house, gives it a very inviting first impression. You won’t have to do anything to the interior or exterior of this house. It is ready to be moved right into. One of the best features of this home is a beautiful spacious great room. It includes a custom made built-in fireplace that is surrounded by finely crafted woodwork. Additionally, there are ample windows that let in soft natural lighting and illuminate the room with the morning sun. The high ceilings and warm wood floors in the great room give it a very cozy feeling. It’s an inviting room that begs you to relax and enjoy the ambiance of the home. Right off the great room is an outdoor patio. French doors lead from the great room to an open, outdoor room. This patio is a great place to entertain and enjoy nature at its finest. You will enjoy a dramatic staircase that lead to the upper level of the home. The stairs are highlighted in white railings and wooden steps. This draws the eye up to to the stairway, which is a focal point of the home. Decorate this stairwell at Christmas time and you will be ready for any holiday celebration. 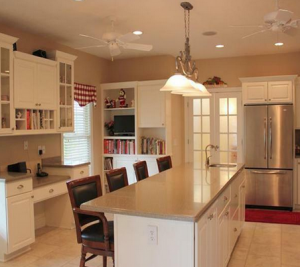 Another highlight of this gem of a home is the kitchen. The clean white cupboards give a bright and cheerful air to this kitchen. You will enjoy the Corian-topped island which also serves as a breakfast nook. One of the eye catching things you will notice about the kitchen cupboards are the two cupboards that have a glass front. You can display your favorite collection of glassware, china or crystal vases. New stainless steel kitchen appliance give this kitchen a modern feel. You will also enjoy a pantry in this spacious kitchen You can never have enough storage space to store canned goods, cookware and other kitchen accessories. Other important features of this home include four bedrooms and four full bathrooms along with two half bathrooms. Whether the bedrooms are used for family members or as guest rooms, there are enough private bathrooms for everyone to shower and get ready in the morning. For more information or to schedule a showing, visit our Contact Us page or speak with an agent directly at (440) 974-7444.